Known as the 'Diamond Claude' by virtue of its faceted format, this exquisite painting on copper is one of a clutch of such works executed by the celebrated classicist. Claude Gellée was born in Lorrain, but spent most of a productive life in his beloved Italy, especially Rome and its pastoral environs exemplified in the Campagna. Initially inspired by northern artists active in that city, Elsheimer and Bril for example, Claude became fluent in the idealising vocabulary of Bolognese painters such as Domenichino. 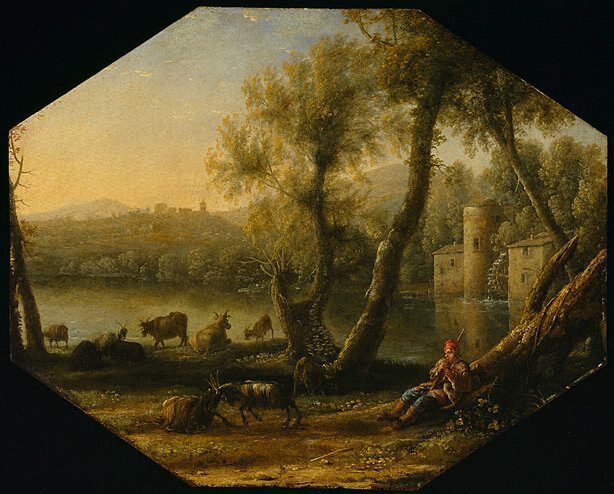 Behind his Arcadian landscapes lay a reliance on forms and relationships found in nature, especially the varied effects of natural light which are his hallmark. 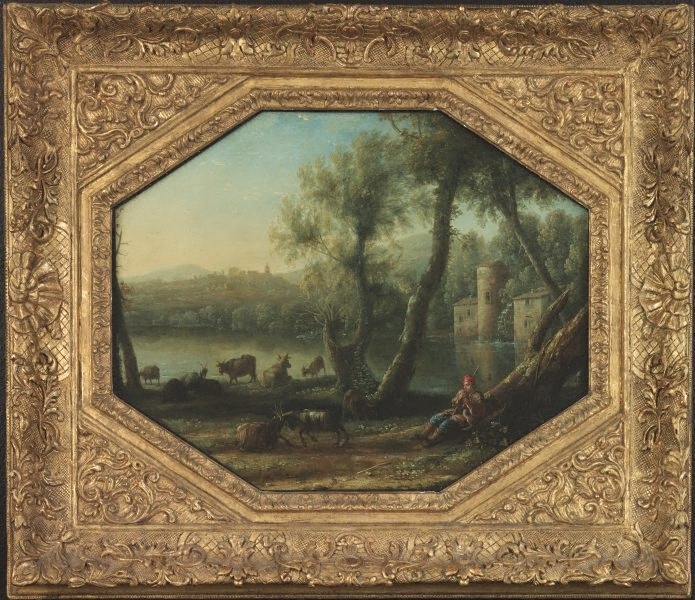 'Pastoral landscape', with its lakeside setting, predicts the great seaport subjects of his maturity - works that profoundly influenced the romantic Turner. Claude's wider influence on subsequent landscape traditions in Europe is inestimable. Count Carl Gustav Tessin, Sweden, Probably Count Carl Gustav Tessin, Swedish Ambassador to Paris 1739-43, and collector. Samuel Woodburn, London/England, [dealer] his estate sale Christie's London, 15-19 and 23-25 May 1854, 7th day, 24 May 1854, lot no. 844, bought in, 460gn 'From the Swedish Minister's Collection'. His sale, Christie's London, 9 and 11 June 1860, 2nd day, lot no.136, purchased by Cockburn, 300gn. The price and buyer are recorded in an anotated copy of the sale catalogue in the National Gallery Library, London. Cockburn, post 11 Jun 1860, Purchased at Christie's London, 11 June 1860, lot no. 136, 300gn. The price and buyer are recorded in an anotated copy of the sale catalogue in the National Gallery Library, London. Lady Binning, 1909-1952, England, by descent from George Salting to his niece Katherine Augusta Millicent Salting (only child of George Salting's brother William Severin Salting) who married George Baillie-Hamilton, Lord Binning (1856-1917). George Baillie-Hamilton, 12th Earl of Haddington, 1952-29 Nov 1968, Scotland, by descent from Lady Binning to her son George Baillie-Hamilton, 12th Earl of Haddington, Mellerstain. Sold Christie's London, 29 November 1968, lot no. 74. Agnew's, London, 29 Nov 1968-1973, London/England, Purchased by Agnew's at Christie's London, 29 November 1968, lot no. 74. Sold to James Fairfax 1973. James Oswald Fairfax AC, 1973-09 Jul 1992, Bowral/New South Wales/Australia, Gift of James Fairfax 1992. Purchased by James Fairfax from Agnew's 1973.